We are a small team of qualified Carpenters experienced in Bespoke Fitted Furniture as well as Professional Painting and Decorating. 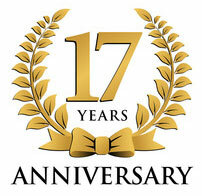 We have been serving the local community for almost 17 years offering top shelf made to measure Carpentry. We specialise in Home Decor Improvement and Innovative Storage Solutions. We come highly recommended in Ascot, Berkshire and its surrounding villages, however we also cover other home counties such as Surrey, Buckinghamshire and West London. 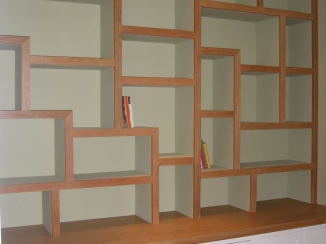 We specialise in designing and fitting an extensive range of bespoke fitted furniture such as Alcoves Cupboards, Geometric Shelving, Bookcases, Media Units and Wardrobes. We can design and build Alcoves Units, Bookcases, Office furniture, Media Units & Under Stairs Storage and Shelving. 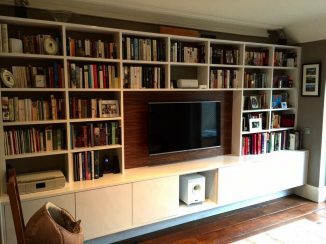 We can design and build Bookcases, Media Units, Geometric Shelving & Traditional or Contemporary Fitted Wardrobes & more. We can design and build Outdoor Decking & Fitted Furniture, Bathroom & Utility Room fitted furniture & more. We are proud members of The Guild of Master Craftsmen and we are fully insured. To find out more about The Guild of Master craftsmen click here. 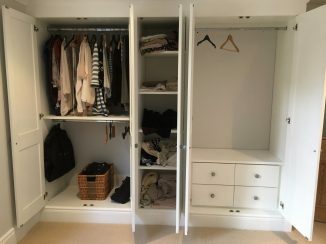 I have used Alcoves of Ascot on several occasions, to build wardrobes in my son's bedroom, to build a bookcase in my daughter's room and to fit new internal doors. I have always found Phil's work to be of the highest standard, each time he delivered my requirements exactly, was quick, efficient and reliable as well as extremely good value for money. I wouldn't hesitate to recommend Phil or his team to others. Phil Brown did a really great job for us. We have an old house with uneven walls and very unusual shaped rooms, yet he managed to evolve a wardrobe and dressing table exactly to our concept and worked in a neat and tidy unobtrusive way. Phil was recommended to me by a friend and I would be happy to recommend him in turn. He completed everything to a high standard despite issues with sloping floors and ceilings in an old property. He thinks things through and gave good advice on the best way of configuring things. I am very happy with the work. I am delighted with the bookshelves Phil and his team made to fit an awkward corner in my house. The finished article looks amazing and they were thoroughly nice chaps to have in the house! Find the latest photos of our projects and other news! Arrange a quote today - we offer free consultations.